Do you love Music ? Movies ? then definitely you will be in love with VLC Media Player. GNU/Linux , Windows , Mac OS X and other computer Operating sytems. VLC is a free and open source multimedia player and framework that plays most popular multimedia file formats like FLV,MPEG-2, H.264, DivX, MPEG-4, MKV, WebM, WMV MP3 , as well as Blu-ray, DVD, Audio CD, VCD,Webcams ,Media Converter and various streaming protocols. So.The latest version of VLC Media Player is awailable. VLC MEDIA PLAYER 2.0.2 Is the version which is unofficially available online . if you visit the offcial website of Videolan Organization you can just download the older official version of VLC 2.0.1 so where to download ? is it safe ? 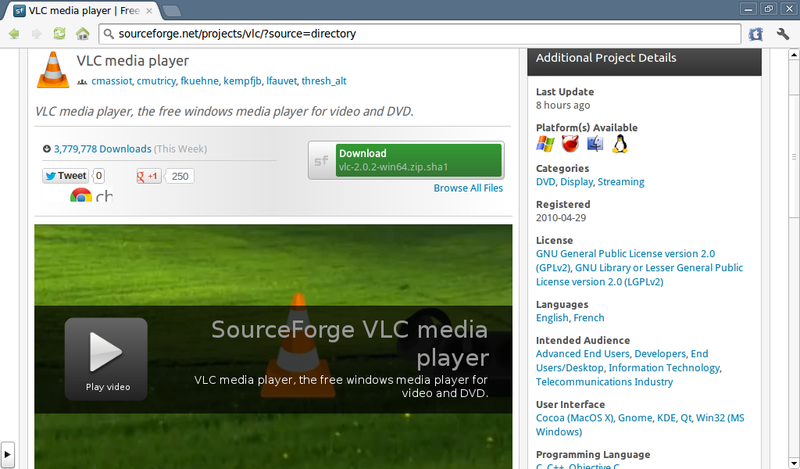 well recently Videolan organizatoni has just updated the source code of VLC media player on Sourceforge.net(SourceForge is dedicated to making open source projects successful.) you can download it from this website or from any other website. It's Simple Powerful Fast and Completely Free, zero Spyware, Ads or User Tracking .so the official website is not talking about any update but Don't worry they will announce soon about the update.So if you can't wait for the official release of VLC Player 2.02you can download it from soft pedia or from sourceforge or you don't wanna download it then just click on the Help Menu of vlc player and check for the update.